Cantu® Shea Butter Leave In Conditioning Repair Cream is an intensive deep penetrating leave in cream conditioning treatment that is made with pure Shea butter and other natural oils to stop and mend breakage, repair split ends, and add manageability and shine with every application. 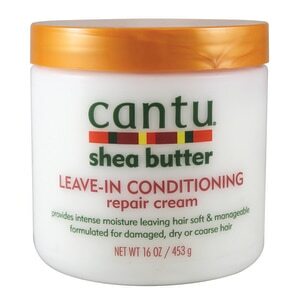 When used daily, Cantu® Shea Butter Leave In Conditioning Repair Cream helps promote strong, long healthy hair. stop and mend hair breakage. protect hair from heat damage. Leave In Treatment - Apply as directed for "Daily Styling" just after shampooing. Re-apply and cover with a plastic cap overnight for maximum absorption and intensive conditioning. Frizz Free Hair - Apply daily to split ends or damaged areas. Comb through and let dry naturally. ALWAYS REMOVE OR NEUTRALIZE CHEMICAL TREATMENTS BEFORE APPLYING ANY STYLING OR CONDITIONING PRODUCT. AVOID CONTACT WITH EYES AND ANY OPEN OR IRRITATED SKIN. IF EYE CONTACT OCCURS, RINSE THOROUGHLY WITH WATER. IF EYE IRRITATION PERSISTS, CONTACT A PHYSICIAN. FOR EXTERNAL USE ONLY. IF INGESTED, CONTACT A PHYSICIAN IMMEDIATELY. KEEP AWAY FROM FLAME OR HIGH HEAT.